Back on the river again and into white water. Image courtesy of Kevin Callan. After the whisky-fuelled antics of the previous day, this episode sees the gang of four firmly back on the river and tackling some fun, bouncy white water, including the washing machine. Kevin has a very different “wash” experience to the one he had in the Balvenie distillery. Ray seems to take on the persona of Austin Powers, at least in his choice of colour combinations, but still makes the paddling look effortless. Groovy baby!! 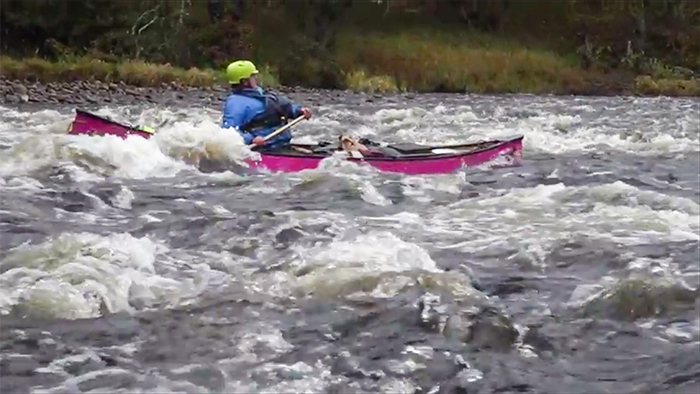 Watch parts 5 and 6 here: Canoeing The Spey With Kevin, Ray & Justine parts 5 and 6 – Where Does The Whisky Come From?